Sometimes it’s hard to make interesting images of important events. Often things just aren’t that interesting. Press photographers, at least in the UK tend to ‘set up’ a picture, but its something I always try to avoid. We don’t seem to have the clear distinction between news and features that is always made in the USA, where the kind of things that many British newspaper photographers do as a matter of course would soon get them fired. But at least it is rather more difficult for photographers to completely fabricate stories. Or to ask other people to make up stories and phone them in to you. One of the more appalling stories to hit the UK political blogs recently is a leaked email apparently from Diana Appleyard of the Daily Mail offering £100 to anyone who wanted to phone her with “anonymous horror stories of people who have employed Eastern European staff.” I don’t know how many responded to her call, but it seems a golden opportunity for spreading nasty racist slurs – and for the Daily Mail to stoke the prejudices of its readership. But it was the Daily Express where in 2004 NUJ members objected to the pressure being put on them to write articles denigrating gypsies, who ran the headline: “CHRISTMAS IS BANNED: IT OFFENDS MUSLIMS” (our Muslim relatives send us Christmas Cards – and expect to get them,) and much more designed to stir up and encourage anti-Islamic prejudice. 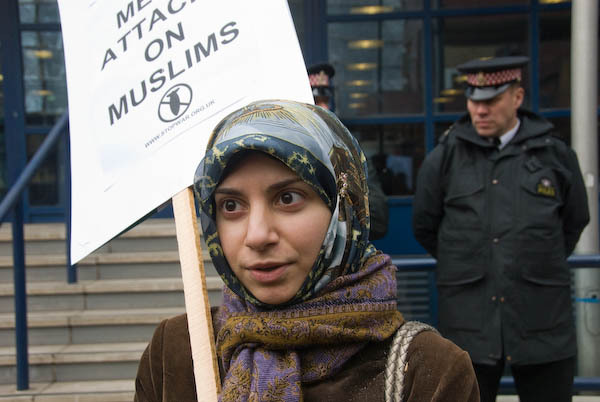 And on Thursday, around 20 people picketed the Express offices on Lower Thames Street with placards asking for an end to media attacks on Muslims. My framing cropped the placard that said “Stop Media Attacks on Muslims” but otherwise I think it was the best picture I took. You can read more about it, and see a few of the pictures I took at the event on My London Diary, where I hope you will notice some changes to the site. It took a lot of fiddling to get the new design to work in Internet Explorer 6, which just doesn’t do some things right. It isn’t really possible to get it to work properly, and the site is best viewed in more up-to-date browsers such as Firefox, where the improved navigation really seems to help. Back to thinking about photographing events that lack the kind of visual interest that photographers would like. I think photographers have got to sometimes admit that a particular event was not that visually interesting, and be prepared to turn in pictures that show it as it was. Setting up pictures is putting a foot on a slippery slope and we owe it to those who see our pictures not to mislead them. This entry was posted on Friday, February 22nd, 2008 at 10:00 pm and is filed under My Own Work, Photo Issues, Political Issues. You can follow any responses to this entry through the RSS 2.0 feed. You can leave a response, or trackback from your own site. The new version of My London Diary looks rather slick. Well done.